There are many dangers of having a gum abscess, aside from pain and irritation it could lead to serious conditions such as swelling of the bones, the difficulty of breathing, and in very rare occasion even death. 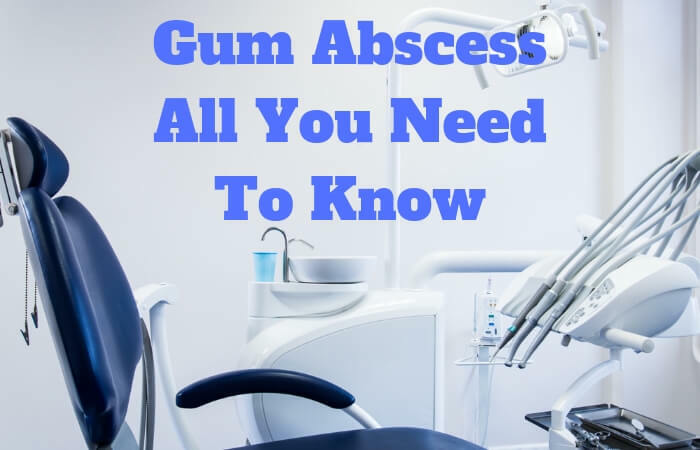 In this article, we will help you understand the causes, symptoms and home remedies for gum abscess, as well as the serious complications if left untreated. It is a painful gum condition, also known as a periodontal abscess; where a pocket of pus develops on the gum after an infection occurs. For example, when you’re not able to remove even a small piece of food or item between your gum and tooth, an infection develops in that area. The gum would look swollen and you can see pus in between the tooth and gum. It is advisable to contact your dentist immediately when you notice any or all of the symptoms above. The dentist might order a dental x-ray to check for an infected tooth or periodontal disease (gum abscess) and treat it before it damages your bones and healthy tissues around the affected area. A persistent abscess can be severely painful and if left untreated, it can cause damage to the healthy tissues and bone around it. A gum abscess is a complication of a more serious condition—which is commonly due to a dental infection. Tooth decay or dental caries: As the decay-causing bacteria in your mouth attack the tooth’s surface, or enamel, it creates a small hole in a tooth, which is called, cavity. Caries eventually breaks down the softer layer of tissue under your enamel, until it penetrates the soft inner pulp of your tooth up to the bone that surrounds and supports your tooth. Plaque: The plaque on your tooth contains bacteria. If the bacteria reach your gums, it would become infected as well as the tissues surrounding the root of your tooth. Gum injury: Damage in the gum area due to accidents during dental procedures can cause an abscess. Perhaps you have heard about draining abscesses at home. While it is not advisable to squeeze or pop out an abscess because it may push the pus into a bigger tissue space and spread, there are ways to manage the abscess. Avoid hot or cold food and drinks. Never floss around the affected gum! While the remedies above can lessen the pain, it is still very important to consult your dentist to avoid serious complications of a gum abscess. Rinse your mouth with salt water to lessen swelling and reduce pain. Simply mix ½ tbsp. of table salt with a half glass of tap water and swish it inside your mouth. Do this for 2 minutes and spit the water out. You can do the same procedure as number 3, using 1/2 tbsp. baking soda mixed with 1/2 cup warm water and a pinch of salt. Gargle for five minutes. The baking soda has antibacterial properties and it effectively removes plaque as well. Crush fresh cloves of garlic, make it into a paste and apply on the gum abscess. Repeat the process several times a day. Garlic has antibacterial properties that kill the bacteria. Let the abscess ooze out on its own. Rinse your mouth with water and resist the urge to squeeze the gum. It is important to see a dentist even after the pus oozed out because the pus will build up again when the source of infection is left untreated. If you have a bad tooth, the best remedy is for the dentist to pull it out and prescribe antibiotics. If you don’t treat the abscess, complications can occur, and some of them can be life-threatening. A blood clot at the vein near your brain: When bacteria get into the bloodstream it could form a clot at the large vein located near your brain. Your doctor has to act immediately as it could be fatal if untreated. Bone infection. Bacteria from the abscess could travel to the blood and infect the bone near the abscess. It could spread to any bone in the body as the bacteria travels through your blood. The doctor may have to prescribe oral or intravenous antibiotics to treat the infection. Dental cyst at the root of your tooth: It may require surgery or antibiotics, or both when the cyst gets infected. Mouth infection: When the floor of your mouth gets infected because the bacteria from the abscess spread, it could cause swelling and pain in your neck and under your tongue. In severe cases, you may find it hard to breathe as well. This condition is fatal and requires prompt medical attention. Tender cheeks: The bacteria could infect the tissue behind your cheekbones. It is very painful and your doctor may have to prescribe antibiotics and anti-inflammatory medications. Boost your immune system, eat healthy foods, exercise regularly and seek treatment for your existing health conditions. People suffering from cancer and diabetes have a weakened immune system –and it increases their chances of developing dental infections. Treat tooth and gum injury immediately. If you have an injury on your gums or teeth, get it treated as soon as you can to prevent the bacteria from reaching and infecting the damaged area. Make sure you take vitamins that help strengthen your oral health as well as your immune system. A gum abscess is not always what it seems, as there may be underlying issues that need to be treated such as a weakened immune system. Orthodontists could help you address the underlying cause of your gum abscess after a visual observation. You may have to have bright exam lights, take x-rays and undergo surgery to treat it. At times you may only have to take antibiotics and anti-inflammatory medications. If you notice signs of a dental abscess, consult a dental professional.